Call for a CASH QUOTE - Junk Cars Atlanta area- Sell Your Car Today! We buy junk cars in the Atlanta, GA metro area. We come to your location at a time that’s convenient for you and pay you cash in hand on the spot and tow your old car away for free. If you are in a situation where you feel like junking your car for quick cash is the best alternative then we can help. We can give you an estimate over the phone of how much we will give you for your car. We can set a time and date at your convenience to execute the cash transaction and removal of your unwanted vehicle. Don’t worry about where to junk your car. We come to you wherever you vehicle is located. Get more cash for your junk car in Atlanta, Georgia! Trying to sell a junk car and need a new Georgia title? We bought this car in Atlanta. It was in the back of a mechanic shop. This young lady had already spent $4,000 repairing the first problem. Now the engine is bad, and she’s not going to sink more money into it. It’s a 18 year old car, and it’s just time for a new one. She wanted to find a junk car buyer and get rid of it. We came out, gave her cash in hand and towed her car away for free. This young man said, “I wanted to find a junk car company near me so I could get better service.” He had a 2003 Volkswagen Jetta that would constantly overheat after driving it for a few minutes. He had taken it to a mechanic shop to get it repaired. When he was hit with the $2,000 repair cost, he decided to junk it for cash and get a new car. We Buy Junk Cars in Atlanta! We pay cash for junk cars in the Atlanta area. We cover all Atlanta area zip codes. We send a licensed and insured tow truck out to your vehicle’s location and pay the agreed upon price. Cold hard cash guaranteed. Is your salvage car all rusted out or in complete disrepair? Don’t fret! We’ll buy your scrap car no matter what condition it’s in! We buy ANY car in ANY condition. We buy wrecked cars. We buy cars that are completely dead. We pay cash for cars that are parts. We buy cars that need a little work to get them going back on the road again. All that matters is that your car has all the components still attached like the engine, the transmission and other major parts. It doesn’t matter if you need us to remove an SUV, sedan, motorcycle, commercial vehicle or junk truck, you can trust us for Atlanta junk car removal! This young lady had a 2004 Dodge Stratus. The engine was completely seized up in this car. She was planning on getting it fixed, but she felt like it would be a waste of money. She saved up a few checks and got a new car. After letting her old car sit in front of her family’s house on the side of the street for a few weeks, she finally got tired of looking at it and decided to call us. See the smile on her face. She couldn’t believe how quick and easy it was. Because we buy junk cars all over the Atlanta area, we were there within the hour with the cash and a tow truck. Once everything checks out, we’ll give you cash for your car on the spot and tow it away for free! No hassle. No headaches. No hidden charges. Just more cash for your junk car! He drove his car into his girlfriend’s apartment complex and couldn’t drive it out. He decided to let it go. He only paid $750 for the car and just wanted to get from point A to point B until he got a new ride. After the tires went flat, he didn’t feel like spending any more money on the car. The car was just sitting there for a while, and he knew the apartment complex was going have it towed sooner or later. He decided to sell his car, so he junked it for some fast cash. This 2008 Toyota Prius was originally in a small front end collision that damaged the bumper and deployed the driver’s airbag. Since it’s such a simple repair, he decided to save some money and do it himself. When he puts the key in to start it up, nothing happens. Why won’t it start? He takes his car to the dealer and they flat out refuse to work on it. He tells me that most customers end up not being able to pay for these sorts of repairs. It takes quite a few hours to troubleshoot electrical problems on a hybrid, so the dealer wouldn’t even do a diagnostic. I’ve never heard that one before, but I’m not surprised because repairing your car at the dealer can be more expensive than buying another car. He realizes the car is junk and does the most sensible thing. He decides to get some cash, and get rid of a car that apparently, no one can fix. When he called he asked, “Do you buy junk cars near me?” I told him we cover the entire Atlanta metro area. He said, “I want to sell my car to a junk car buyer that’s near me.” We’re near everybody in the middle of the city in the midtown area. We can make it to any city around i-285 in under 30 minutes. I went to southeast Atlanta to get this car. When I walked around and looked at it, it looked pretty good. I asked what was wrong with it, and they replied the engine was bad. So I popped the hood and opened it and noticed there was something missing. The customer said, “Oh yeah, we took the engine apart while trying to fix it and put the rest of it in the back.” So I went around to the back and opened the rear hatch and saw half the engine in the trunk. I looked at the engine pieces then looked at the customer and said, “I’ll take it.” I paid them the cash, loaded up the junk car and was on to the next one. We make Atlanta junk car removal as simple as possible for our customers. Simply call (404) 468-4589 and we’ll make you and offer right then and there! Alternatively you can get a quote for your junk car online. Whether you want to sell your scrap car, used car or salvage car, we’re the buyer to call. When you call us just let us know your vehicle’s year, make and model a brief or detailed description of your car’s condition. You can tell us about any service records or any diagnoses done by a professional or not so professional mechanic. All this information will help us give you an accurate cash price for your junk vehicle. We cover the entire Atlanta metro area. We travel all along 285 and beyond. If your vehicle is at your house, your office parking lot, your mechanic’s shop, the tow yard, the corner gas station, Walmart’s parking lot or the side of the road, we come to you and towing is always free. Our schedule is your schedule. We know a car can break down at anytime so we have drivers on standby around the clock 7 days a week to get you the cash you need for your junk car. We can schedule a pickup a week in advance or we can show up within the hour. Most customers tell us “I’m definitely happy I found a junk car buyer near me,” because the customer gets better service. We bought this Jeep in the West End Atlanta. The customer said the transmission fluid was dirty. He decided to call a junk car removal service because he said it was too difficult to change the transmission fluid. I was a little skeptical about his story. I asked him if he thought the transmission was bad he said no. I asked him if he knew how much it was to replace the transmission and he told me he checked around and a used transmission was expensive. I started to wonder why he was checking transmission prices if he only needed to change the fluid. Anyway, I paid him the cash and loaded it on the tow truck. Decided to junk it for cash after a month and I needed a junk car buyer near me. The car had been sitting in a hotel parking lot for over a month. Fortunately, their friend owns the hotel. Any other hotel would have towed it away after a few days. They said it was in good running condition, and the only thing wrong was a dead battery. Dead battery huh? I get to the car and the window is already down. Must be a bad window motor. I see the window glass taped to the door to keep it form falling. I realize there may be a few things this customer left out in their description over the phone. I ask the customer for the title. He already has it in his hand. I glance at it. Perfect. Bought this car from an impound lot in Northeast Atlanta. When I pulled up, the customer was driving a newer Range Rover. I was impressed by his resilience to say the least. When I saw the car, it was hard to believe the driver was walking around without a scratch. Can’t say the same for the passenger. He was tossed out the rear ,driver window. How he got from the front passenger seat to the rear driver window is hard to imagine. Don’t worry, I was told he survived and is recovering from a few injuries. Anyway the customer said, “I didn’t have time to wait, so I searched for someone who pays for junk cars near me and I’m very satisfied with the speed in which you got here.” We’re in the middle of the city of Atlanta, so we’re close to pretty much everything. Do your eyes decide what car you buy? Some people fall in love with the way a car looks. Some people fall in love with what a car can do for them. Have you ever purchased a car because it was “cute”? If so, maybe that’s why you’re on this page. Beware of cars that look good but are always in the shop getting repaired. Do your due diligence and find out if the reliability of a car is worth the price first and look at appearance later. I know how cool you would look in a car like this ’08 Malibu, but how cool are you gonna look on Marta or in somebody else’s passenger seat while your car is parked in front of your house with flat tires waiting on you to get the money to fix it? We bought this junk car in the 30317 area of Atlanta. “I had a hard time finding a junk car buyer near me,” the customer said. When I opened the hood on this car, engine parts were all over the place. Somebody had started taking the engine apart and left it undone. The customer was stuck with the unfinished work. He didn’t have the money to pay a real mechanic to fix it, so he gave up and decided to get some money for it. Just recently paid cash for this car is Atlanta. It’s a nice car but the engine was knocking loudly. It’s going to need the engine to be replaced before it can be put back on the road again. The tires were in good shape and the transmission is shifting properly. The body only had a small dent on the front driver side fender, and the mileage was pretty low at 167k miles. This little rehab will make somebody a nice car and since tax season is only a couple weeks away, there will be plenty of people wanting to buy an affordable car that’s good on gas. He thought it was safe to park in front of his house. No one heard or saw anything. He just walked outside one morning to crank up his car, and it looked very different. He said some choice words that most of us would have and didn’t know what to do. He only had liability insurance on this old car and couldn’t get any money for repairs. He decided to get some cash for his junk car instead of fixing it. This car is being crushed at the scrap yard near me. The engine went out, and we decided to crush it. I guess we could have sold some parts off of it, but space is limited in our yard so we decided to get some fast cash for it. This car is gonna be smashed and cut up into little pieces so the metals can be separated melted down and recycled. After the metals are separated and melted down, they will be bought by a third party who will make something new with them. Junk car removal is not something people ever think about until their car breaks down and they don’t want it anymore. In most cases we are not a company that most people like to see coming. But junk car removal is important to the environment and to neighborhoods that don’t want old cars sitting around with flat tires and collecting rust. Yes, junk cars are definitely an eyesore. The only time people want to see a junk car is when he or she is looking for a part to repair his/her own car. And that’s pretty much where all these junk cars end up in junkyards where people can come and remove parts from a car that might have a bad engine, transmission or it may have been in an accident. But sometimes the junk cars are just too old and not very valuable for parts so we gotta send ‘em to the scrap yard and have it crushed and recycled into a new refrigerator or something. Another bonus to selling us your car is we’re Atlanta’s environmentally friendly junk car removal experts. When you sell junk cars to us, we’ll reuse, resell or recycle your junk car in accordance to Georgia’s state laws for junk car disposal. Junk car removal is an important part of keeping Georgia neighborhoods clean and your neighbors happy. I had a customer who actually was in a little fight with her neighbors because they didn’t like the old car she had parked in the driveway. The car had been sitting in the same spot for years and had leaked out all the oil on the driveway that left an ugly oil spot. Her neighbors repeatedly asked her to get rid of the car, but she loved the car and wanted to fix it one day so she refused to junk it. She admitted that she was being a little selfish by not removing the car, but she felt a connection to her junk car. That connection was quickly severed when the county code enforcement officer issued her a citation for her old car. She quickly got on the phone and called us to come and remove her old car. If you’re not a car salesman or have never sold a car before, it can be a little uncomfortable to sell a car, especially a junk car. When you think of who buys junk cars, you may not know who to talk to. The only people who buy scrap, salvage or junk cars are junk yards, tow truck drivers, mechanics, used car dealers, metal recyclers and hobbyists. After you find a junk car buyer, you have to have the skill and know-how to sell you junk car or truck. You have to be ready to talk shop talk about a car which not a lot of people can do. You also have to be available to schedule a time that’s convenient for both you and the random amount of people who may want to purchase your old car. Finally, you have to meet unfamiliar people in whatever location your car is in. It’s not easy to sell a car in bad condition. More Cash for Junk Cars Atlanta makes it easy for you to deal with all these issues. We come to you wherever your car is located with a licensed and insured tow truck ready to remove your junk car for free. We establish a price over the phone and pay you cash in hand for your old car on the spot. When we come out, you are guaranteed to sell your car. She didn’t want her junk car to get kidnapped! We paid cash for this junk 2004 Toyota Solara in the Northeast Atlanta area. This lady drove her car out of her parking garage. It only had a few issues that weren’t too serious–like a few check engine lights because of some air hoses that were connected wrong, and it was overheating because it was low on coolant. The car drove great, and she loved it because she bought it brand new. She had been driving it since she was a freshman in college. She started wondering how to get money for her old car when she stopped driving it after buying a new one. Her maintenance people in her underground parking garage where she lives started to complain, so she had to hurry up and get rid of her old car before they put a sticker on it and towed it away. 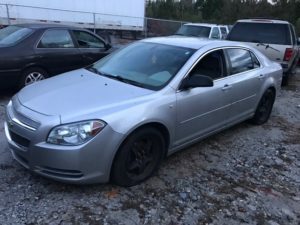 She decided to call Cash for Junk Cars in Atlanta to get some fast cash for her junk car instead of letting it get kidnapped by the towing company. We pay cash for cars and trucks in the Atlanta area. I bought a car yesterday from a guy in the 30014 zip code area of Atlanta. He had a 2004 Honda Pilot, and it had broken down on the side of his neighborhood street about 2 blocks away from his house. The guy was standing by the vehicle when I got there looking relieved to finally get it removed from the street so he can stop worrying about it. We greeted each other and, and I inspected the vehicle. Not only was it not running, but it had also been in an accident. I was told that an unmarked commercial truck had backed into it at his job. He said the incident was on camera, but since the truck was unmarked they couldn’t find out who it was. Oh well, no problem for me; I can still buy it. That’s what we do. We buy junk vehicles under all sorts of difficult circumstances. I gave him the cash in hand, loaded the vehicle up and got out of there.